Actor Matthew Perry with NADCP CEO West Huddleston (Photo credit: Talk Radio News Service)Have you ever been to court for any reason? Maybe you needed to appear for a traffic ticket, custody hearing, divorce proceeding, or probate hearing. Perhaps you've been summoned for jury duty. It is probably fair to say that many of us have been in a courtroom for one reason or another and, if not, there is a good chance that you have watched television shows like Judge Judy, Judge Joe Brown or The People's Court. What do all judicial proceedings have in common? Each proceeding is officially opened when the court clerk or marshal utters the simple, albeit powerful, phrase "All Rise!" You might think that the phrase "All Rise" is all about showing respect for the Judge, but really it is more about showing respect for the judicial process and all participants: the judge, jury, defense counsel, prosecutors, defendant(s), witnesses, family members, court personnel, and the courtroom observers. For many in attendance it connotes a new beginning...perhaps the first day of the rest of their life. Earlier this week we wrote about the importance of understanding drug court. We talked about the availability throughout the United States. Sometimes the average citizen (defendant) facing sentencing for a drug offense or DUI/DWI might be under the misconception that drug court sentencing is only available for the rich and famous. On the contrary, if drug court is offered in your jurisdiction and the nature of your offense provides an opportunity for you to participate in drug court, then listen to your counsel. You don't have to be rich and famous, only willing. The good news is this: the rich and famous who have experienced drug court for themselves or for a family member or friend can be your advocate. Perhaps their advocacy is most striking in their work with the NADCP's public service announcements most appropriately named "All Rise!" Take a few minutes to watch this NADCP Public Service Announcement. 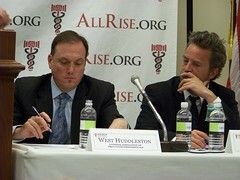 It might just change your life or the life of your loved one...celebrities "all rise" to promote drug courts.